Discussion in 'Online Casino Promotions' started by Marina, Sep 19, 2016. The success of every great rock show starts with a warmup, and so there is no reason why the same thing can’t apply to the successful launch of a brand new, long-awaited rock-themed video slot game! We’ve been hearing so much about NetEnt’s expected Motorhead video slot game, themed on the rock group by the same name, that we can’t wait to try it out for ourselves. Here’s a great way for you to enjoy a free spins warm up at the popular Guts Casino online gaming site prior to the official launch of Motorhead video slot. To get ready for Motorhead video slot, you’ll get a chance to play any of your favorite video slots at Guts Casino between today and the official launch date – September 21st 2016. 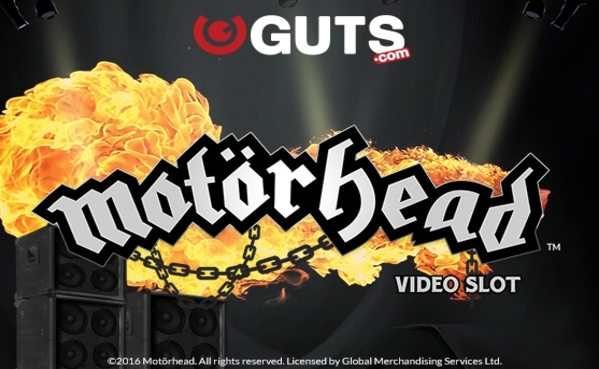 Guts Casino will be giving away free spins on Motorhead slot when it launches, with the number of free spins depending on how much you wager in the three-day Backstage Free Spins offer. Even better: There are no wagering requirements on the free spins that you earn! How Can I Win Free Spins? Your first step is to log into your real money account at Guts Casino anytime between now and 23:59 Wednesday, September 21st 2016. You then play any slot game with real money to start earning free spins ahead of the official launch of Motorhead video slot. On Thursday, September 22nd, you are invited back to Guts Casino to claim your free spins. To qualify for the free spins on Motorhead video slot by NetEnt, you will need to play real money bets on video slots, 3D slots and classic slots found in the games lobby at Guts Casino. Unfortunately, table games, live dealer games and other games at the site will not qualify you for free spins. You cannot use bonus funds and other locked funds in order to place bets on the slot games during the promotion period. Free spins on Motorhead video slot will be awarded to all qualifying players at 17:00 CET on Thursday, September 22nd, 2016. Players will need to claim these free spins within 48 hours of them being awarded, otherwise they will expire. Other terms and conditions may apply. Please check at Guts Casino. Motorhead video slot is the third and last game in NetEnt’s triology of games based on famous rock groups and singers in the music business. NetEnt kicked off the series with Guns ‘n Roses video slot and continued with Jimi Hendrix slot.